Listonic, an intuitive shopping list app, uses both English and Polish versions of Sugester. Links to the suggestion forum have been placed in several places on the website (e.g. Contact section, Menu in the footer). For over a year, Sugester has cooperated with capital city of Poland, Warsaw. During this time, internet users, had a significant role in helping develop the functionality and usability of the city's website. Sugester became a tool that not only gathered opinions and suggestions about the site, but also comments and improvements that could be made to the city itself. The application allowed urban users to submit suggestions and bugs, which helped improve the online service for all users. Thanks to Sugester, we could quickly respond to errors or concerns. This solution greatly facilitated the exchange of information between the creators of the city web portal and urban users. 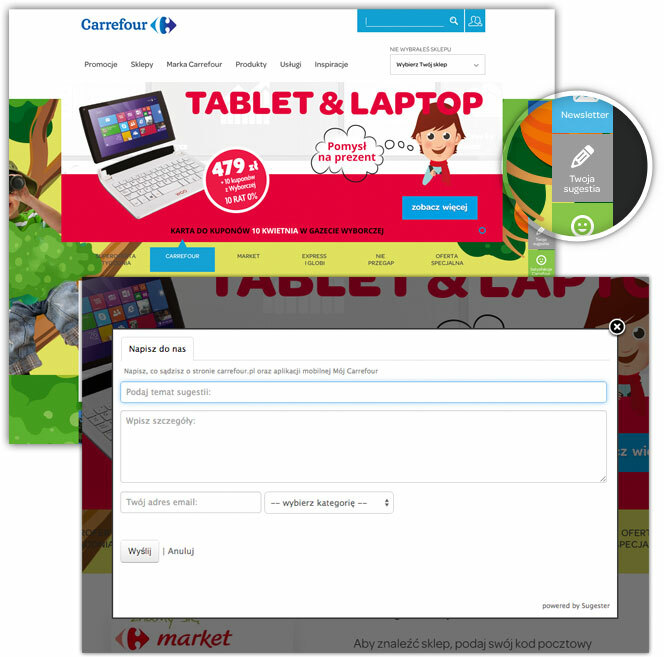 Carrefour hypermarkets and supermarkets use Sugester to make their website more transparent and accessible. The Carrefour suggestion forum is closed, meaning that users can make a suggestions, which go directly to the creators of the site, but they cannot see or vote for other users' suggestions. When a user adds suggestions and enter their email address, administrators contact the users personally.